The Buffalo Sabres are a very discouraged bunch of hockey players these days. Then again, can you blame them? 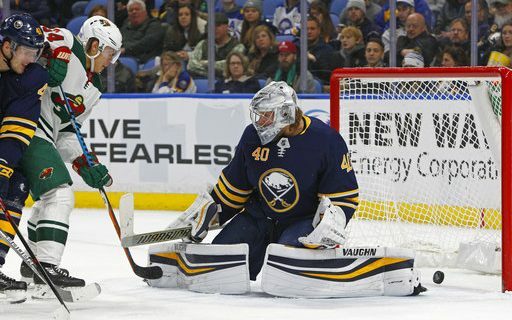 The Minnesota Wild handed the Sabres a 5-4 loss in the KeyBank Center on Wednesday night. That means Buffalo is 0-5-2 in their last seven games, dropped three straight in this current homestand. This team knows it is not doing enough to win games, and it can’t figure out how to fix it. As of this writing Wednesday night, the Sabres were in danger of falling into 31st and last place in the National Hockey League standings. The suddenly revived Arizona Coyotes could have passed Buffalo with a win against San Jose later on Wednesday. Realistically, though, the difference between being No. 30 and No. 31 doesn’t matter much. “We’ve got to be better than that,” O’Reilly said. The entertainment value for the casual fan of Wednesday’s game was higher than the losses earlier in the week. That’s because there was some scoring, as what has been the Dead Puck Era of Sabre hockey came to an end for at least a night. Jack Eichel got the Sabres off to the start they wanted when he jammed one in at 6:55 of the first period. The theory was that a goal would help the offensively challenged team relax a bit. But about two minutes later, ex-Sabre Tyler Ennis scored on a shot with his back more or less turned to the net. Mikael Granlund and Nino NIederreiter made it a 3-1 game in the next six minutes, and the Wild never trailed the rest of the way. A change in goalies to Robin Lehner for the start of the second period didn’t help much, as Niederreiter and Granlund scored again. But at least Nolan and Sam Reinhart got those goals back to make it 5-3 after 40 minutes. The Wild spent most of the third period turning down the offensive temperature of the game, and it generally worked. But Nolan’s shot from the boards cut the lead to one with 6:05 left, giving the Sabres a spark. Buffalo put up a fight in those final minutes, and Kyle Okposo was stopped on a blast with Lehner pulled for an extra attacker. Yes, the Sabres haven’t shown any quit lately and have fought to the end, but that’s small consolation for a team that doesn’t get credit in the standings for moral victories. They haven’t shown through 22 games that they are good enough to win consistently. “For me, I didn’t think we followed our gameplan for 60 minutes,” coach Phil Housley said. “It’s the mistakes that are costing us. I don’t believe everyone is on the same page. They are taking things in their own hand, and this is the result. The Sabres and their next opponent, the Edmonton Oilers on Friday, probably will be thankful to play another struggling team. The matchup between Entry Draft classmates Connor McDavid and Eichel usually gets the attention, but the teams don’t have the luxury of worrying about such things now. They both need a win badly. We’ll have to see which team plays like it.